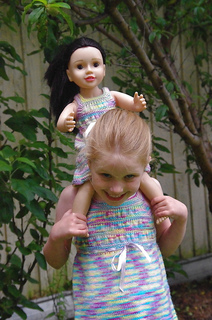 to fit 18-20" dolls with a chest of approx 11" This sizing is suitable for Australian Girl Dolls, American Girl Dolls, Gotz and other similar sized dolls. dolly darwinia is the first perfectly matching doll version of the patterns in my Australian Wildflower collection. 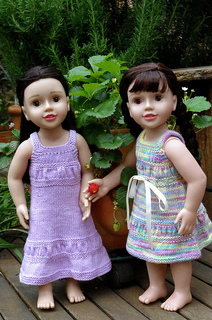 It can be knit in two styles; the baby doll complete with ribbon tie and fuller skirt, and the dress with a more a-line skirt. Both feature the same gathered bodice. 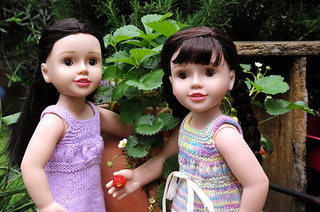 Nothing could be sweeter than matching darwinias for your wee girl and her little doll.